In general the Licensing flow of a self-hosted version of WebSpellChecker on both Windows and Linux-based operating systems is simplified. With the Internet connection, the license can be activated in two steps. The license activation process can be automated, and used in a silent installation mode. Even though a license is still hardware-based, the license can be easily reactivated and migrated to another machine. Warnings, errors and statuses about the license are more clear and self-explanatory in Logs. Visit the updated license activation guides for more details. [WP-2569] WProofreader: Changes made in the Dialog mode are not saved to the CKEditor5 body. Support of as you type mode for editors based on a custom data model. WProofreader fully supports ‘as you type’ mode in a wide range of WYSIWYG editors with a custom data model and virtual DOM such as CKEditor5, Quill, Trix, ProseMirror, Scribe. Accessibility compliance updates. The green color that was used for check-boxes and radio-buttons in the Options and Languages settings tabs has been replaced with the contrast one. This is required to by WCAG 2.1 and Section 508 accessibility standards. Enabled compound words checking in Dutch. Enabled <SplitWords> option that allows receiving correct suggestions (as a compound word, or two words separately) to words specific for the Dutch language. Added support of SSL certificates with passwords.SSL certificates are used to setup a secure HTTP connection between the client’s application and WebSpellChecker AppServer. Since some of the SSL certificates are protected with passwords, a new parameter has been added to the AppServerX.xml file. Please visit Configuring WebSpellChecker Server Parameters to find all available parameters in AppServerX.xml. In Setup SSL Connection with AppServer 5.0, you will find the guidance how to secure your requests. [WP-2538] AppServer: MSVCR120.dll library is missing during installation on Windows Server. 1.1. Added new options for WProofreader management. Two new API options enableAutoSearchIn and disableAutoSearchIn are added to give more control over the autoSearch functionality. enableAutoSearchIn parameter allows enabling the autoSearch mechanism only for elements with provided class, id, data attribute name or HTML element type. disableAutoSearchIn parameter allows disabling the autoSearch mechanism by class, id, data attribute name, and HTML elements. 1.2. API documentation updates. API documentation is updated with the descriptions of the following parameters: autoSearch, enableAutoSearchIn, disableAutoSearchIn. enableAutoSearchInInputs option is no longer supported as it was replaced by enableAutoSearchIn. 1. Added better descriptions of errors for the cases of incorrect use of the cmd parameter. The command value for ‘cmd’ parameter is not specified in your request. Contact support@webspellchecker.net for more details. The command value for ‘cmd’ parameter is unknown. Check available commands. Contact support@webspellchecker.net for more details. [WP-1810] AppServer: The following parameters doesn’t work: ‘IgnoreAllCapsWord’, ‘IgnoreDomainNames’, ‘IgnoreHtmlMarkups’, ‘IgnoreMixedCase’, ‘IgnoreMixedDigits’, ‘IgnoreNonAlphaWord’. [WP-2380] WProofreader: Focused state is missing when using keyboard navigation between Options, Languages, Dictionary, About tabs. [WP-2421] WProofreader: Incorrect area-label name for the opened state of the WProofreader Dialog icon. [WP-2442] WProofreader: Incompatibility of WProofreader with Froala Editor. Incorrect behavior of getFocusableElements in component.js in place with querySelectorAll and passed array (convert array to string). [WP-2420] Personal User Dictionary: After removing a dictionary, the words are not underlined and considered as incorrect. 1.1. ‘Maximize/Restore’ button in a dialog mode. 1.2. Improved notifications on the UI when working with user dictionary to bring clarity to your users. Check our video to learn more about notifications and how to use personal user dictionary with WebSpellChecker Proofreader. The grammar checking for Ukrainian, Russian, Catalan, and Swiss German languages is now available in both Server and Cloud versions. While providing you with the proofreading tools and services, we gradually implemented your suggestions on making the spell- and grammar checking more convenient. Still, there’s a limit of brushing up the old products. To make the tangible change, we decided to create a whole new solution, based on your and other customers’ ideas on how proofreading should be done in the modern Web. Today we are happy to introduce you the all-new Proofreader. We hope it will become just what your users and your development team lacked for their spell- and grammar checking needs. From now on you don’t have to sacrifice one usage scenario in favor of the other. The Proofreader comprises the proofreading modes, which were previously available only in separate products. Now your app’s users can decide how they want their text proofread: be it correcting mistakes as they type, or hasteless proofreading of all the text at once in a separate dialog. A single script for all fields. Whichever types of editable fields you have in your app, there’s just a single Proofreader script, to enable spell- and grammar checking in all of them at once. Even in CKEditor5, which is currently lacking of the built-in way to proofread. Here is a list of rich text editors and editors based on custom model where we have a chance to test our Proofreader: CKEditor 4.0+, CKEditor 5, Froala Editor, TinyMCE 4.0+, Kendo UI, Textbox.io, Summernote, Nicedit, Redactor, Quill, Trix, ProseMirror, Draft.js, Scribe. There is wide list of other editors available, we haven’t test it everywhere. If you have an editor that is outside this list, it doesn’t mean that Proofreader won’t work there. We encourage you to try first and see if it works. In case you experience any troubles with the integration, reach us, and we will try to help. Self-sustaining proofreading. Whenever you need to add new editable fields in your app, the Auto-search functionality of the new Proofreader will detect them and enable the proofreading automatically. Please visit Get Started with Server WSC Proofreader (autoSearch) and Get Started with Cloud WebSpellChecker Proofreader (autoSearch) for guidance accordingly. The suggestion box is simplified. We’ve hidden rarely-used toggles and switches leaving only the primary task of choosing the correct words in the plain site. Hover for suggestions. No clicking necessary. Spelling and grammar suggestions for marked words appear on mouseover. A subtle tactile change, making proofreading feel even more effortless. Tuning up became easier. All the necessary settings are now always at hand under the neat badge in the bottom right corner. 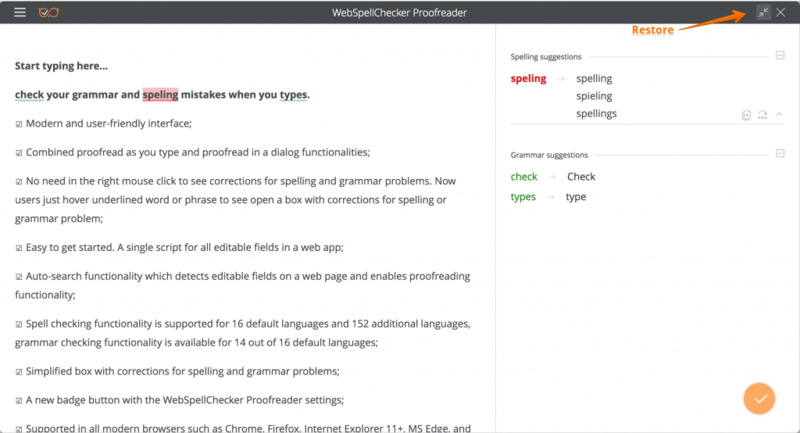 As easy as it looks the Proofreader is powered by the mighty WebSpellChecker proofreading engine, providing spell checking in 16 default and 152 additional languages, and grammar checking in 14 out of 16 default languages in all modern browsers. We added two new API options that give more control over the autoSearch functionality of WebSpellChecker Proofreader. By default, Proofreader with the enabled ‘autoSearch’ option will be enabled in all supported editable fields on the page. However, we understand that this might be inconvenient, as there might not be a need to check some types of editable fields. Now you can choose where you want disable Proofreader. You can disable Proofreader in any type of editable field by class, id, data attribute and elements. We decided to disable Proofreader auto-enabling in the HTML <input> element by default. However, you may change this behavior and allow Proofreader checking in <input>. We enlarged both American and British Medical dictionaries with 550 new terms. Visit a demo page with Medical dictionary to evaluate its quality. With WebSpellChecker Server 5.2.0, we improved the security of our installation packages for Windows servers. Now our builds are more secure as signed using a code signing certificate issued by a trusted Certificate Authority. It gives an additional warranty for our customers that our software can be trusted, and it doesn’t come from a malicious hacker. 1.1. WebSpellChecker Server 5.1.0 supports LanguageTool 4.2. We have upgraded the version of the new 3rd party grammar engine, LanguageTool, that was integrated into WebSpellChecker as a part of our major release 5.0.0. As a part of this upgrade new and improved grammar rules for the next languages: Dutch, English, German, Greek, Portuguese, Spanish, French. 1.2. Now the new grammar engine supports Java Runtime Environment (JRE) and Java Development Kit (JDK) with Java 8 and higher. Visit WebSpellChecker System Requirements to learn about the additional software and infrastructure you will need to run WebSpellChecker Server. 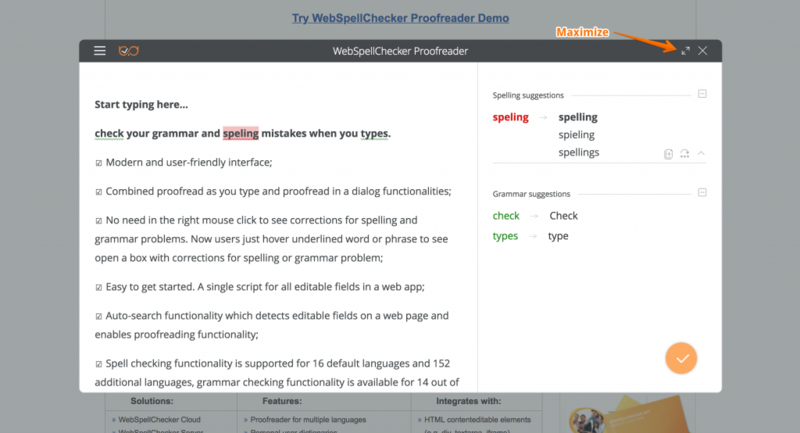 We keep improving our new product, WebSpellChecker Proofreader, that has been introduced in one of our recent releases. Let us remind that WebSpellChecker Proofreader is based on SpellCheckAsYouType (SCAYT) core. It is designed to simplify the integration and combine the functionality of proofread as you type functionality and proofread in a dialog. Our paid customers can already start using the first versions of WebSpellChecker Proofreader at no additional fee. Please visit Get Started with Server WebSpellChecker Proofreader (autoSearch) for guidance. Proofread as you type functionality on multiply languages. Spell checking functionality is supported for 16 default languages and 152 additional languages, grammar checking functionality is available for 14 out of 16 default languages. Simplified box with corrections for spelling and grammar problems. A new badge button with the WebSpellChecker Proofreader settings. No need in the right mouse click to see corrections for spelling and grammar problems. Now users just hover underlined word or phrase to see open a box with corrections for spelling or grammar problem. Please visit a demo page of WebSpellChecker Proofreader to evaluate its work. This version with proofreading in a dialog functionality will be available in our upcoming release 5.2.0 (Mid of September 2018). [WP-2074]: Italian language spell checking: Incorrect type of the accent is used for words with final ‘e’, e.g. the Italian word for “why” is “perché“ and not “perchè”. GitHub #159: SCAYT plugin for CKEditor: SCAYT polluting global page styles. [WP-2027]: Linux Installer: Installing WSC App on Apache Tomcat: Outdated link to the guide with the configuration of Java Application Servers. [WP-2030]: ‘Status’ command: Incorrect description of ‘NOT ACTIVE’ status is used for the Grammar engine for WebSpellChecker Server installed on a Linux server. [WP-1639]: Incorrect information is recorded into log files when AppServerX service is being stopped, it says that it is started instead. [WP-2029]: AppServerX service is stopping too slow on Windows servers. This issue will be present and reproducible for CKEditor 4.10, as this fix in WSC plugin has been included in a new release of CKEditor 4.10. This is a hot fix release which includes minor update for a new version of CKEditor 4.10.0. This is a hot fix release which includes several fixes for minor issues in new version of CKEditor 4.10.0, and older versions of Froala Editor.